A Southern Luzon-wide network of civil society organizations working for the promotion and protection of human rights was launched in Cavite. Some 300 representatives of basic sectors from labor, urban poor, farmers, fisherfolks, women, youth, transport workers, church and anti mining advocates, gathered Wednesday at the historic Casa Hacienda popularly known as the Tejeros Convention Center in Rosario Cavite, to launch the Mamamayang Nagkakaisa sa Laban ng Bayan para sa Karapatan or Manlaban Ka. Made part of the launching program is a forum on charter change and human rights with constitutionalist Christian Monsod and former Representative Erin Tanada as guest speakers. Representatives of the CHR also graced the occasion. 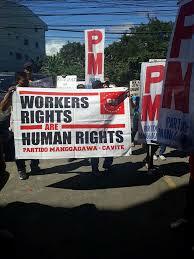 The formal launching was followed by a march of the participants to the Cavite economic zone in support of the strikebound workers of Dong Seung, a garments factory. During the past several months, a series of labor disputes around the freedom of association and working conditions have rocked the Cavite ecozone, the country's biggest publicly-managed zone. Ecozones particularly in the provinces of Cavite, Laguna and Batangas employ tens of thousands of workers. Regrettably it is also in these economic havens of foreign investors in the country where rampant violations of human and labor rights go unchecked and the violators go unpunished. The launching of Manlaban Ka is the final outcome of a five-month process of consultations and focus group discussions among the basic sectors and civil society organizations working for the promotion and defence of human rights in the Southen Luzon region. This partnership building initiatives among the CSOs is in cooperation with the Commission on Human Rights (CHR) under its Governance in Justice or Go Just program. The Southern Luzon process was facilitated by Kalipunan ng Kilusang Masa, with Partido Manggagawa (PM) and Sentro ng Nagkakaisa at Progresibong Manggagawa (Sentro) as lead organizations. Prior to this launching, consultation meetings were held in Calamba City last April 7-9, 2018 where participants discussed the state of human rights in their respective areas and sectors. Resource speakers were invited in this process to give inputs on the many aspects and forms of human rights issues, including the many cases of extrajudicial killings in the southern Luzon region due to the ongoing war on drugs as well as violations of the economic, social and cultural rights of our workers, farmers, urban poor, women; and the destruction of many communities due to mining and land-grabbing activities. Representatives from Bicol, Mimaropa, and the Calabarzon areas have actively participated in the previous process leading to their decision to form this loose but highly coordinative network of organizations willing to work together for the promotion and protection of human rights. “NANININDIGAN ang MANLABAN KA na ang mga karapatang pantao at demokrasya kung saan maraming aspeto nito ay hindi pa namin ganap na natatamasa, ay nararapat lamang na ipagtanggol at ipaglaban sa halip na isuko sa harap ng sinumang kapangyarihan na may hayagan at tagong layunin na ito’y pahinain o kaya ay ganap na patayin.